This weekend I made good on that promise. 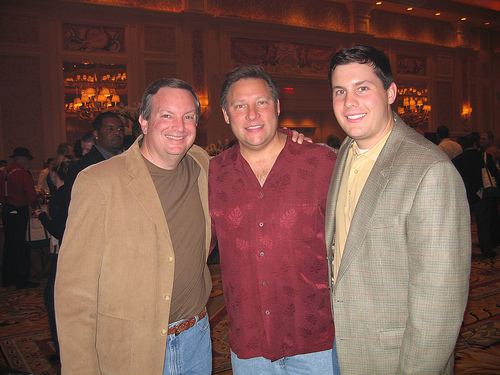 And let me tell you that with all the free-flowing booze samples, incredible cigar handouts, and hoards of superstars from the industry, the Big Smoke is a must attend for every stogie enthusiast. Now I had originally intended on bringing along a notepad and trying to have detailed (but brief) conversations with tobacco’s heavy hitters. For several reasons, not the least of which was a crowd of over 6,000, that just wasn’t possible. So instead of trying to convey the tremendous atmosphere to you via text, I thought I would share some of my favorite photos. Special thanks to my dad and his colleague, Mark Carlson, for helping me handle the camera in the hectic excitement. 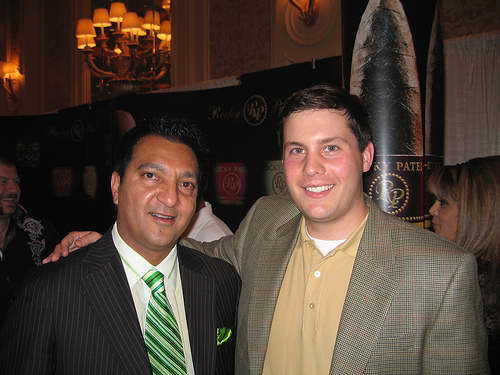 Perhaps not surprisingly, some of the longest lines of the night were at the Rocky Patel booth. But it was well worth the wait. Mr. Patel spent a good portion of the evening posing for photos, like this one with yours truly. Tim Ozgener was really in the thick of things, helping many guests establish good lights on samples from his Criollo line. Where else but at the Big Smoke can you have your cigar lit by the president of a major tobacco organization like CAO? Mr. Ozgener seemed pleased to hear my favorite CAO is the Brazilia Gol. 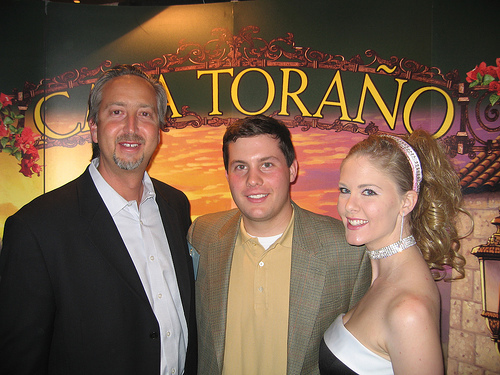 My dad and I are all smiles posing with a few “representatives” from Arganese. 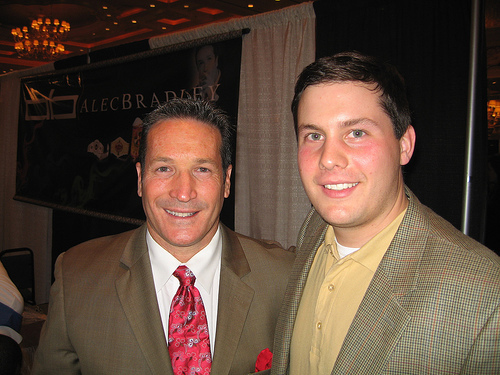 Alan Rubin of Alec Bradley was a real pleasure as he handed out samples from his Maxx line. He told me he was especially proud of the limited edition blend he created called “Dodge Challenger.” Reviews of both are forthcoming. I didn’t mind telling Charlie Toraño how much I enjoy his Signature Collection. 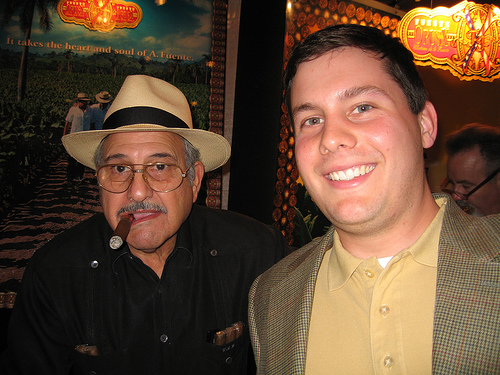 Carlos Fuente Sr. spent most of his evening frantically signing Big Smoke programs and Arturo Fuente baseball caps. My dad, Mark Carlson, and I pose for one last photo before heading out for dinner, drinks, and blackjack. It was a real honor to meet everyone at the event – from La Flor Dominicana’s Litto Gomez to La Aurora’s José Blanco to all those pictured above. Something tells me this won’t be my last Big Smoke. 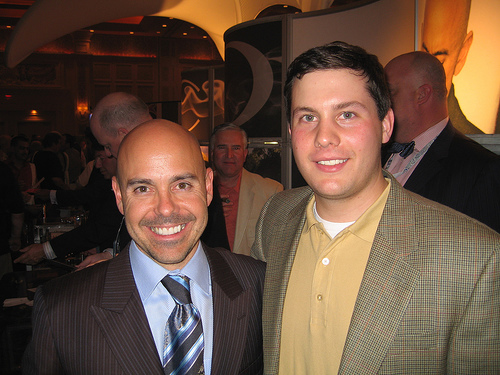 What a great opportunity to meet the best of the best in the world of cigars. Looks like you guys had an awesome time. Thanks for the report. How many smokes did you walk away with? I pulled in about 30 wonderful-looking smokes and consumed another 2 during the show. The Big Smoke policy is to give every patron a coupon book for the various sticks at the beginning. You have to walk around to the many booths to pick the cigars up individually. Personally, I think the event would have been more enjoyable if they just gave you all the cigars in a giftbag as you left. That way you'd have more time to talk, smoke, drink, and eat instead of worrying about collecting all the goodies. I do have a question. At the risk of sounding critical, I was wondering if the gentleman in your Alec Bradley photo is actually named Alan Rubin? I thought I read somewhere that he named his line of cigars after his two sons, whose names are Alec and Bradley. I'm not sure I have this right, but I could have sworn that I saw this somewhere. If not, disregard. Love your blog! Thank you for catching that. It is clear my knowledge of the Alec Bradley brand is a bit lacking, and I look forward to changing that. When I met Alan I thought he introduced himself as "Alec," but it was hard to tell because the event was so loud. amazing event pics! how did it feel to actually sit with Carlos Fuente Sr.? an icon! i missed this year's Big Smoke in Vegas, and will miss the New York event..but not next year….thanks for the shots, StogieGuy! Patrick…..great shots. Your photographer really has a steady hand! Must have been the Crown. Really enjoy your articles…… and your dad……keep up the good work! Sounds like you had fun. I go to the Vegas Smoke every year. We go with anywhere between 2 and 6 people. If you go next year, email me and we will hook up before. The trick is to get about 5 or 6 people to split the coupons up, each taking 5 or so. Then, you only have to go to 5 or 6 booths to get the cigars. Meet up after the event and split up the bounty. It only took us about 15 minutes to go throught the coupons and we had the rest of the time to check stuff out. This is my first time on the site. Looks great. Take care.